The Bill was a European pole weapon that was fairly commonplace during the medieval era, as it possessed the stopping power of a spear, the power of an axe, and the added benefit of a hooked protrusion, making it a very versatile and powerful weapon. It was particularly favored by the Englishmen, who maintained the use of the bill well into the 16th century, even as other European states shifted their focus onto the pike and the arquebus. This particular bill emphasizes the more spear and cleaver-like qualities of the weapon, as it lacks the distinctive curved hook that typifies most military bills. 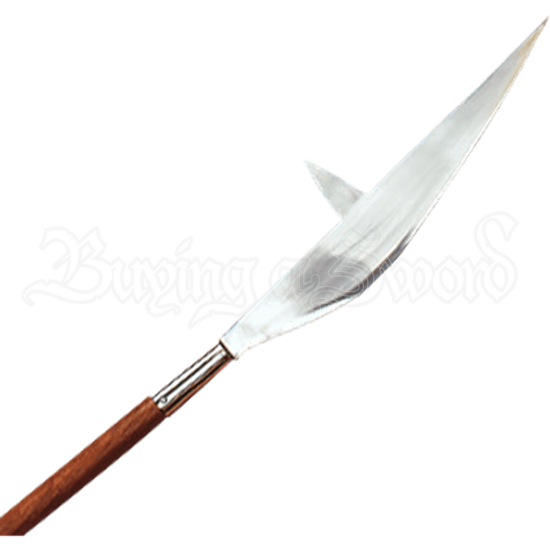 Instead, this bill has a long, spear-like point with a broad, curved blade along one edge, while the back of the weapon features a spiked point. This shift in design does not take away from the bills effectiveness, though, as the mounted spike still makes it perfect for finding chinks in armor, catching unaware opponents, and even penetrating armor. This military bill features a head that is crafted from carbon steel, which measures approximately 26 inches long, while the included hardwood haft measures approximately 72 inches long. 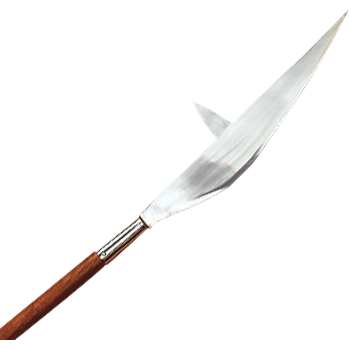 While the rest of medieval Europe converted to the longer pike, the English forces stayed with the Bill, proving the versatility and the effectiveness of this hybrid weapon on the field of battle.